The field of TESOL has called attention to the ways that the issues of race and ethnicity, language status and power, and cultural background affect second language learners’ identities and, to some degree, those of teachers. 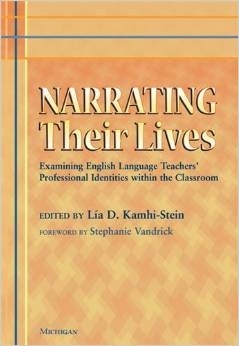 In Narrating Their Lives, Kamhi-Stein examines the process of identity construction of classroom teachers so as to make connections between their personal and professional identities and their instructional practices. To do that, she has selected six autobiographical narratives from teachers who were once part of her TESL 570 (Educational Sociolinguistics) class in the MA TESOL program at California State University, Los Angeles. These six narratives cover a surprisingly wide range of identity issues but also touch on broader instructional themes that are part of teacher education programs. Because of the reflective nature of the narratives—with the teachers using their stories to better understand how their experiences shape what they do in the classroom—this volume includes provocative chapter-opening and reflective chapter-closing questions. An informative discussion of the autobiographical narrative assignment and the TESL 570 course (including supplemental course readings and assessment criteria) is also included. promotes NNS teachers’ professional growth. No discussion of world Englishes or the spread of English internationally is now complete without reference to the NNS movement. This book celebrates its first decade and charts a direction for its growth and development. The NNEST Lens invites you to imagine how the field of TESOL and applied linguistics can develop if we use the multilingual, multicultural, and multinational perspectives of a NNEST (Non Native English Speakers in TESOL) lens to re-examine our assumptions, practices, and theories in the field. The NNEST lens as described in and developed through this volume is a lens of multilingualism, multinationalism, and multiculturalism through which NNESTs and NESTs as classroom practitioners, researchers, and teacher educators take diversity as a starting point in their understanding and practice of their profession. The 16 original contributions to this volume include chapters that question theoretical frameworks and research approaches used in studies in applied linguistics and TESOL, As well as chapters that share strategies and approaches to classroom teaching, teacher education, and education management and policy. As such, this volume will be of interest to a wide range of students, practitioners, researchers, and academics in the fields of education and linguistics. Non-native language teachers have often been viewed as an unavoidable fate of the profession, rather than an asset worth exploring and investigating. Now that non-natives are increasingly found teaching languages, and particularly English, both in ESL and EFL contexts, the identification of their specific contributions and their main strengths has become more relevant than ever. As a result, there has recently been a surge of interest in the role of non-native teachers but little empirical research has been published so far. This volume is particularly rich in providing different approaches to the study of non-native teachers: NNS teachers as seen by students, teachers, graduate supervisors, and by themselves. It also contributes little explored perspectives, like classroom discourse analysis, or a social-psychological framework to discuss conceptions of NNS teachers. The majority teachers of English to speakers of other languages around the world are nonnative speakers of English themselves. 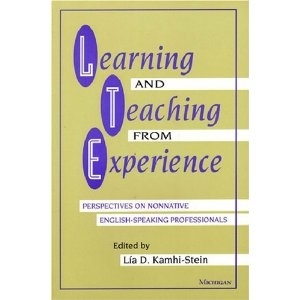 Learning and Teaching from Experience presents a wide range of views on NNES (nonnative English speaking) professionals in ESL and EFL settings at various academic levels-including K-12, adult education, community college, and university. This informative volume is divided into the sections focusing on theoretical underpinnings, research, teacher preparation, and classroom application specific to issues facing NNES professionals. Learning and Teaching from Experience is also one of the first volumes to present work by the founding members of the caucus for nonnative English-speakers in the national TESOL professional association, who are rightly considered to be experts in the field. This book will surely interest NNES teachers and researchers, as well as teacher educators and their trainees in the United States and abroad. The place of native and non-native speakers in the role of English teachers has probably been an issue ever since English was taught internationally. Although ESL and EFL literature is awash, in fact dependent upon, the scrutiny of non-native learners, interest in non-native academics and teachers is fairly new. Until recently, the voices of non-native speakers articulating their own concerns have been even rarer. This book is a response to this notable vacuum in the ELT literature, providing a forum for language educators from diverse geographical origins and language backgrounds. In addition to presenting autobiographical narratives, these authors argue sociopolitical issues and discuss implications for teacher education, all relating to the theme of non-native educators in ETL. All of the authors are non-native speakers of English. Some are long established professionals, whereas others are more recent initiates to the field. All but one received part of the higher education in North America, and all except two of the chapters are at least partially contextualized in North America. Particularly relevant for non-native speakers who aspire to enter the profession, graduate students in TESOL programs, and teacher educators, the unique nature of this book's contributors and its contents will interest researchers and professionals in applied linguistics generally and in ELT, and all those who are concerned with the role of non-native speakers in English-language teaching. Despite the many advantages that a teacher sharing the students’ mother tongue can bring, native speakers are always preferred when it comes to hiring. Yet teachers who are non-native speakers can bring a lot to the classroom. 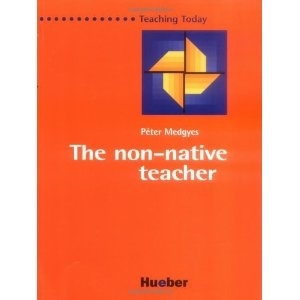 This book examines the differences in teaching attitudes between teachers of English who are native speakers and those who are non-native speakers, and makes a realistic assessment of their respective problems, strengths and weaknesses.Medgyes's analysis of the position of non-native TEFL teachers brings a deep personal knowledge, strong convictions and a sympathetic awareness of the problems facing language teachers of all kinds. He reveals the worries but also stresses the strengths of non-native TEFL teachers who have already travelled the road along which they are guiding their learners. They know from first hand experience what the students will find difficult or strange. This is a stimulating read for both native and non-native TEFL teachers.